Instead of waiting until the last minute to start winterizing your home, get a jump start in fall before it gets really cold. All summer you’ve enjoyed playing, keeping your lawn green, and not worrying about things like frozen pipes, but as the leaves start to drop in fall, turning your attention towards preparing your home for winter is good practice for homeowners. Read through these fall home plumbing tips top make sure your house rides out the winter with no plumbing mishaps. When water freezes, it expands. If you’ve ever filled up a bottle of water and popped it in the freezer for a cold treat later in the day, it only takes once before you learn that you can’t fill it full. Same rule applies to gutters and pipes. Frozen water can tear apart eaves on your roof and even tear gutters right off your house! The more leaves in the way, the more likely your gutter will clog (and then freeze when the temperature drops). Quick Tip: Instead of pulling out leaves by hand or trying to balance with a small broom, try using a leaf blower! If the leaves are dry they should just fly out without a long hassle of an unwanted chore. Once the weather has fully cooled down and you’re not looking to use your water hose anymore, unhook the hoses around your house. Once you know it’s fully drained, store them somewhere inside for the winter. Plastic and rubber can still freeze (and thaw) during colder weather, causing cracks along the way. After your hose is disconnected, make sure that your water spout is turned all the way off and stays that way! Do you have a basement? Check for exposed pipes and insulate any that you can see. The pipes on the outside walls are the most susceptible to freezing. You can find pipe insulator at hardware stores, if it’s not available you can try wrapping towels. Shut off exterior valves if your home is equipped to do so- You may also cover outside faucets using a faucet insulation kit. Make sure your water heater is functioning properly, as it works harder in the winter months. When leaving home in the cooler months, shut off your main water valve and drain system . Make sure the heat is left on and not set lower than 55 degrees. Get your sewer lines checked for roots. Roots grow the most during the summer, wherein they seek out places with the most water – which can sometimes mean your drain pipes. Now is a great time to have your pipes inspected for any blockages – especially if you notice they’ve been slow to drain at all. This can save you from having to deal with a worse problem in the middle of winter should the drain block completely or cause a back-up. Check your garden hoses and taps for leaks. You may not be watering your garden or lawn as much in the fall, so we recommend you check all your hoses and outdoor taps for leaks or drips. If you won’t be using them in the fall, you likely won’t notice a drip that will waste a lot of water. The end of summer is here so we understand if you want to fit in as many barbecues as you can before it gets too cold. Just remember the guidelines for what you should and shouldn’t put down your garbage disposal unit. It’s unfortunate enough that summer is ending, but you don’t want to have to deal with a plumbing problem, too! Check appliances. Summer is a hard time for your laundry machine and drains, what with all the dirty clothes and barbecues and all. Check for any water leaks and slow-draining drains. If your house has interior shut off valves that lead to the outside faucets, close them and drain the water from the lines. 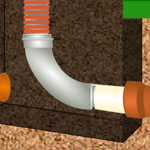 Insulate pipes in unheated areas. Go around your house, especially crawl spaces, attics, and garages, and check to see which pipes are closest to outside walls. Insulate these pipes to prevent them from freezing. Your water heater works harder in the winter months. It’s a good idea to have it flushed out to remove sediment buildup. Sediment can cause corrosion, shortens the life span, and reduces heating efficiency. Clear leaves and other debris from your gutters and downspouts. This will ensure easy drainage for when water freezes and thaws throughout the winter. You could also face other problems if your gutters are clogged and there is lots of ice and snow built up, water seeping into your attic. Check your outside faucets for leaks. When pipes freeze, pressure builds up causing the pipes to crack or break. Disconnect your outside water hose. If it is left connected, the water left in the hose can freeze and expand. This could cause faucets and connecting pipes inside your home to freeze and break. Blow out your sprinkler system. Have your sewer or septic system serviced. Now would be a good time to have your sewer snaked to clear it of any roots. It’s also a good time to think about having your septic system pumped out. Know where your main water valve is. Knowing how to shut off the water main will minimize damage should you have a major leak or a burst pipe.